With its population of 80 million, Vietnam is the world’s 12th most populated country. 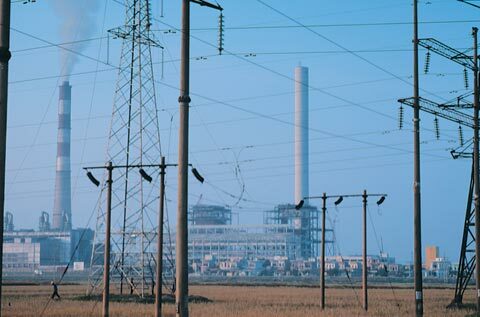 In the past decade, Vietnam’s demand for electricity has grown by more than 10% per year and this development has created a need for new, efficient power stations. One of the largest new stations is Pha Lai 2, which is located 65 km north east of the capital Hanoi. 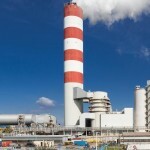 Pha Lai 2 Power Station will be owned and operated by Electricity of Vietnam (EVN). The station will consist of two coal fired units. 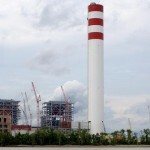 Each unit has a capacity of 300 MWe, which will make Pha Lai 2 the largest coal fired station in Vietnam. 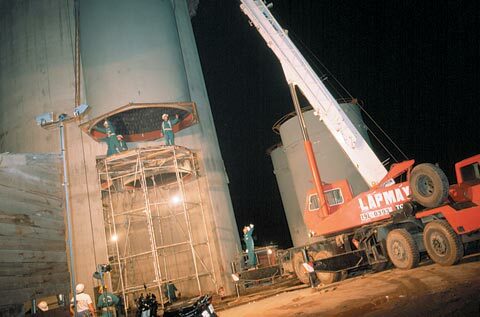 The construction of Pha Lai 2 was awarded to an international consortium of Sumitomo Corporation (Japan), Stone & Webster (USA), Mitsui Babcock (UK) and Hyundai Engineering & Construction (Korea). The Pha Lai 2 site is located near a number of large coal fields and the new power station has been designed specifically for the use of this local anthracite coal. The coal for Pha Lai 2 can be characterized as very difficult; it has an ash content of 27 – 33 % and a volatile matter content of less than 5 %. The sulphur content in the coal is low, at 0,5 – 0,7 %, but nevertheless, a modern flue gas desulphurization (FGD) plant is included for each of the two units. 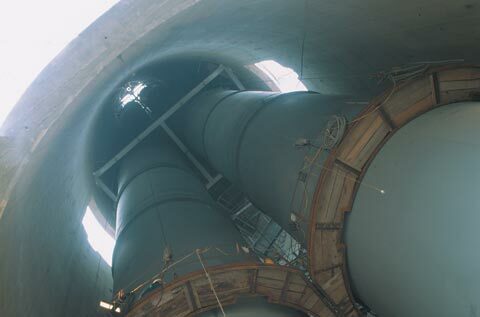 In these FGD plants, 85 % of the flue gas coming from the electrostatic precipitators will be treated in wet limestone absorbers with 90 % SO₂ removal efficiency. The remaining 15 % of the gas stream is bypassed around the FGD absorbers and mixed with the treated gas stream. After the mixing of the two gas streams in a mixing chamber, a gas stream with an average temperature of 58 °C is released to the chimney. 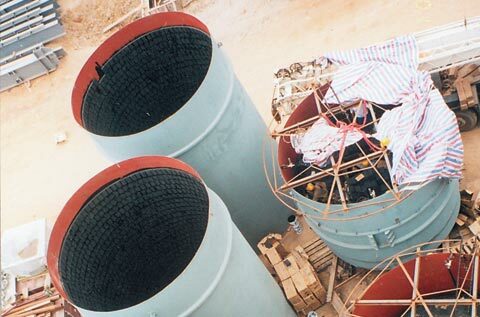 The chimney of Pha Lai 2 is a 200m high reinforced concrete chimney with two 4,5 m diameter steel flues. In order to provide reliable corrosion protection, the PennguardTM Block Lining System was installed on the internal surface of both flues (5.400 m²). Hyundai Engineering & Construction, the consortium partner for civil works and erection, appointed Hamon Mariani Battista S.p.A. (Italy) for the construction of the 200 m high chimney of Pha Lai 2 Power Station. 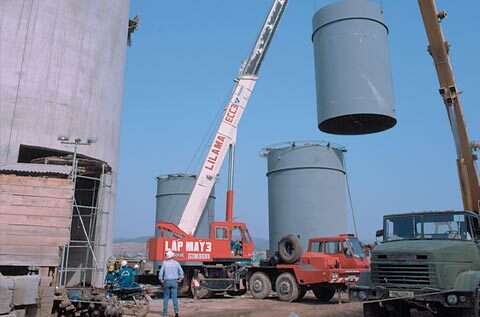 7.2 m high sections (“cans”) of steel chimney flue are grit blasted in a special, off-site location. PennguardTM Block Primer is spray-applied to the steel cans. The cans are transported to the jobsite and placed upright, next to the chimney. 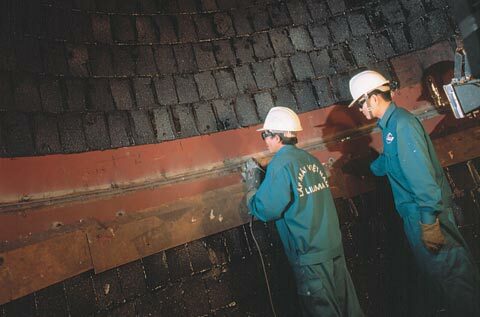 Local personnel install the PennguardTM lining in the steel flue cans, while the cans are still outside of the chimney. The pre-lined cans enter the chimney and are welded to the portion of steel flue already installed. The cans are externally reinforced, to prevent excessive deformation during handling. During welding, special safety measures are observed to maintain fire safety. Inspectors check the field weld. 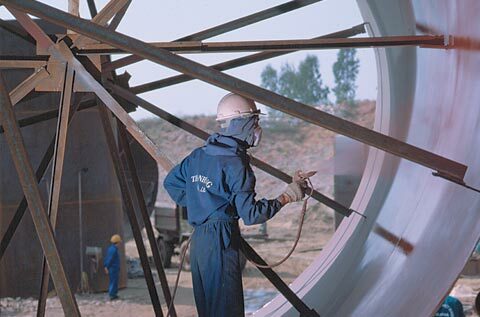 After approval, workers clean the weld area and install a PennguardTM lining over the area of the field weld. The chosen work method proved to be fast and efficient. 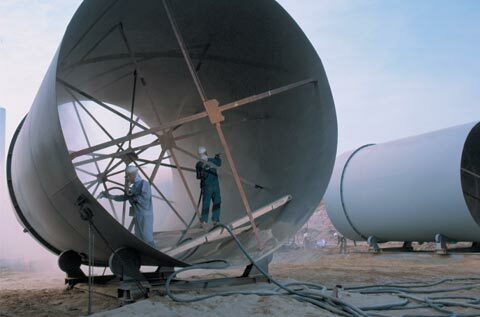 While the lining crew on ground level was producing pre-lined cans on a regular schedule, the erection crew was attaching the cans to the two flues. Using this well coordinated system, the crews installed two PennguardTM-lined steel flues within a period of 8 weeks. The exhaust gas streams from the two 300 MW units pass through precipitators for fly ash removal. Then, 85 % of the gas stream is desulphurized in wet FGD absorbers. The cleaned flue gas exits the absorbers at a temperature of 46 °C, saturated with water. This cool, wet gas is then mixed with the remaining 15 % of the gas stream, which has a temperature of 120 °C. The mixed gas stream has an average temperature of 58 °C. At 58 °C, the flue gas creates a strongly acidic environment in the chimney flues. Even though the gas temperature is slightly above the water dewpoint, it is far below the acid dewpoint, which is typically higher than 100 °C. 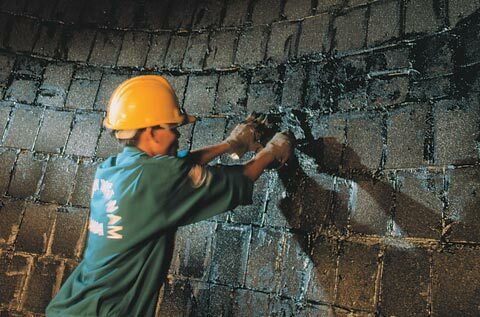 Under this condition, traces of SO₃ and moisture combine to form sulphuric acid condensate on the internal surfaces of the chimney flues. For this agressive environment, a PennguardTM lining offers important advantages. A PennguardTM lining has unlimited resistance to sulphuric acid condensate. PennguardTM linings also have excellent thermal resistance, so that FGD bypass operation will not affect the lining. Furthermore, a PennguardTM lining is not difficult to install, even in a tropical climate with high humidity. Local brick layers can successfully apply PennguardTM linings after a specific training, which is normally done on site. The entire process is uncomplicated and, with proper QA supervision, hidden errors are not likely to occur. 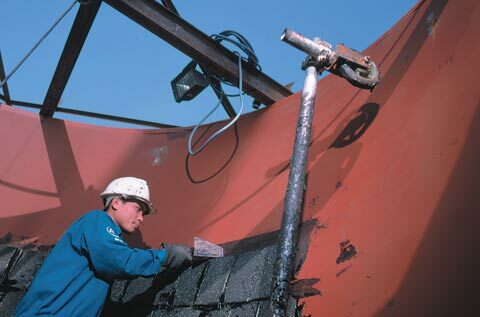 Due to this combination of chemical and thermal resistance and an uncomplicated installation procedure, a PennguardTM lining will offer reliable corrosion protection to the steel chimney flues for a period of more than 20 years.